Here’s something to get your holiday party rolling—a brimming punchbowl of eggnog. Not the cloying, additive-laced stuff sold in cardboard containers in your supermarket dairy section. No, we’re talking real eggnog, made with real eggs heavy cream, fortified with not one, but three spirits (a practice favored by no less than George Washington, who spiked his eggnog with sherry, rum, and rye whisky). The sort of eggnog that’s as thick as friendship and seductive as sin, served under an aromatic dusting of freshly grated nutmeg. And to take that eggnog completely over the top, we add—you guessed it—wood smoke. Actually, smoke comes at the eggnog from three directions. First, from the whisky. Instead of the traditional bourbon, we use smoky single malt Scotch whisky. Next, from the mezcal. I know it’s not traditional, but this smoky agave spirit from Oaxaca, where they roast the cactus hearts in a fire-heated pit, adds an inimitable smoke flavor—not to mention an exotic Mexican taste. Finally, real wood smoke—fired from a Smoking Gun directly into the punchbowl with the eggnog. You may be comforted to know that in times gone by, eggnog was recommended as a remedy for colds and flu. The 1932 novel Cold Comfort Farm sanctions an eggnog cocktail for breakfast. You heard it here first. I guarantee you, the following sure isn’t your parents’ eggnog. Party on! 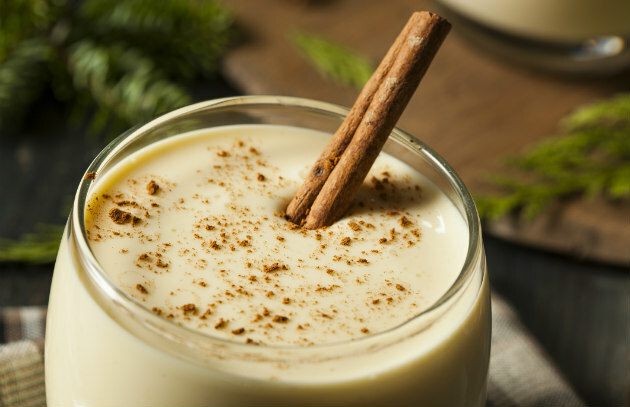 Get the recipe for Smoked Eggnog.